ParenteBeard Wealth Management experienced a limbo state of business for two years as they separated from the accounting firm they had been owned by. They wanted to differentiate themselves from their competitors and also create some distance from their old name. With no direction on where to begin with marketing, and a need for a new name, new brand, and new identity that they could be proud of, they contacted Alpha Dog Advertising. We discussed what the firm was looking for in terms of a rebrand and rebuilding their brand awareness from scratch. The team at ParenteBeard voiced concerns that they did not want to lose their reputation of service or how the structure of their business ran, with the exception of the name and branding changing. To begin the rebrand process, we asked ourselves two simple questions: What events happen in someone’s life that makes them seek out a wealth advisory firm? And how would that tie into the new brand and name we developed for ParenteBeard? 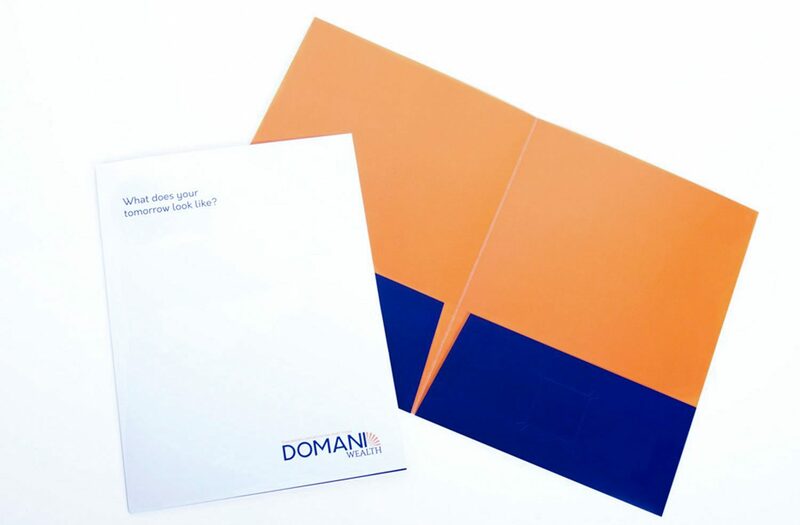 We positioned the newly named Domani Wealth as a tomorrow company. (Domani means “tomorrow” in Italian.) By positioning them as a tomorrow company, and not merely a wealth management firm, the company can be seen as one who can guide their clients through more than just their current assets and investments. They can help clients navigate life events such as retirement, divorce, or the death of a loved one, and all the uncertainty that can come with them. The sole reason an individual or organization chooses to save or invest their finances is to use them later—tomorrow.